Weight: 3 - 6 lbs. Wing Span: 68 - 72"
The head of turkey vultures is perhaps the most unique characteristic, being very small in size when compared to the large body. The head and neck are red in color and lack feathers, with the exception of a thin layer of down. At an adult size, the wings cover a distance (when extended) of around 6 feet and form a shallow "V" shape when in flight. The feathers are nearly black, but the lower half of the wings on their ventral surface is silvery white. The feet are rather weak, they are used for walking rather than grasping prey. The beak is small and light in color. This large bird lives all across the U.S. The small featherless head is ideal for foraging inside of dead animals, like alligators, raccoons, and opossums. They generally hunt their prey by hovering about 200 feet above the ground. 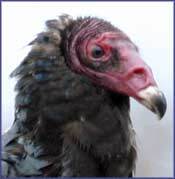 Although the turkey vulture generally migrates, it may stay put during mild winters. The turkey vulture call is generally silent. Hear It Now! The damage caused by these birds can be impressive. They are known to attack roofs, caulking and other exterior surfaces causing extensive damage, and leave bones and carcasses in unpleasant places. Being a large bird, their dropping is significant and can build up quickly if a large flock is present creating a serious health risk. They also have a reputation of being a noisy bird, especially when fighting over food or hanging out in a large group. All members of the vulture family are protected under the Migratory Bird Treaty. This is a heavy, aggressive bird that can literally destroy many standard control products. Specifically designed sound systems employing electronic noises emanating from different speakers at varying intervals like the Super BirdXPeller Pro and CritterBlaster Pro should be used in conjunction with other control methods. Steel Bird Spikes and Shock Tape are also great roost deterrents. Use Structural Bird Net to keep vultures out completely. See our complete list below of recommended bird deterrent products to repel turkey vultures. A "synergy" or combination of bird repellent products typically offer the most successful solution for repelling turkey vultures. For bird control solutions, we often recommend using companion products by combining electronic sonic repeller devices or bird hazers with visual scare deterrents, physical bird barriers or scent and taste aversion products. This kind of multi-sensory attack is extremely effective in deterring pest vultures for good!